European producers are known for their operational strength and production control systems. 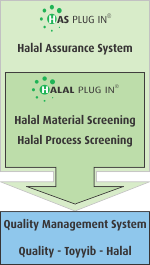 The Halal Plug In® method uses the same methodology to introduce Halal integrity into these production systems. The systematic translation of Halal requirements and screening for Critical Halal Process Steps is the core of the method, with a focus on ingredient and production process compliance. The corresponding procedures and instructions are then integrated into the existing Quality and Food Safety assurance systems. More and more Halal importing countries start to develop their quality and Halal management systems. This trickles down in their Halal Certifier Body Accreditation and Halal Certification requirements. The Halal Assurance System Plug In® again takes advantage of existing quality management systems by turning them into real Halal Assurance Systems. Building on the Halal Screening Core of the Halal Plug In® module, the program focuses on the specific procedures and requirements of a Halal Assurance System. The resulting Halal Assurance Manual and Halal Assurance System are compliant with both MUI HAS23000, JAKIM, ESMA UAE.S 2055, GSO 2055 and SMICC-2 or other, less formalised HAS requirements. As Halal, especially within the international environment, is a rather specialised business, we also offer a total Halal Program Management service. In case of MUI or Jakim direct certification, we can also manage the application process (CEROL SS 23000 for Indonesia; JAKIM/DVS for Malaysia) as no local Halal Certifying Bodies are involved.